Woke, walked Mix and went for breakfast – I was locked out of the farmhouse. Went back to the Granary assuming everyone had slept in. Had a banana and got ready for the day’s work: finding the dining room table and extricating it from its home in one of the barns. Just as I was about to start, Mum came looking for me to enquire why I hadn’t come for breakfast. It turns out the door had been locked inadvertently and my breakfast was waiting for me. So I went and enjoyed a late breakfast. Then it was time to start work on finding the table. It is a special table which belonged originally to Professor Forester of New College. He wanted it to live in a manse and so he gave it to my father. 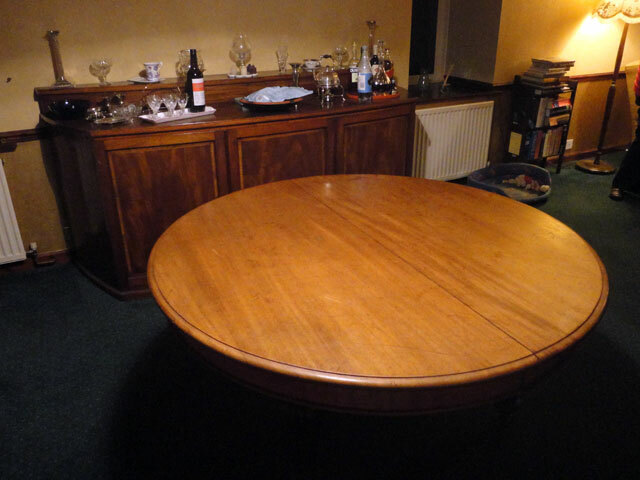 (I think the truth of it was that he came to Dad’s induction at Newtyle (my father’s first charge) and was taken aback to discover that my parents had so little appropriate furniture so he gave them this table and a matching sideboard.) 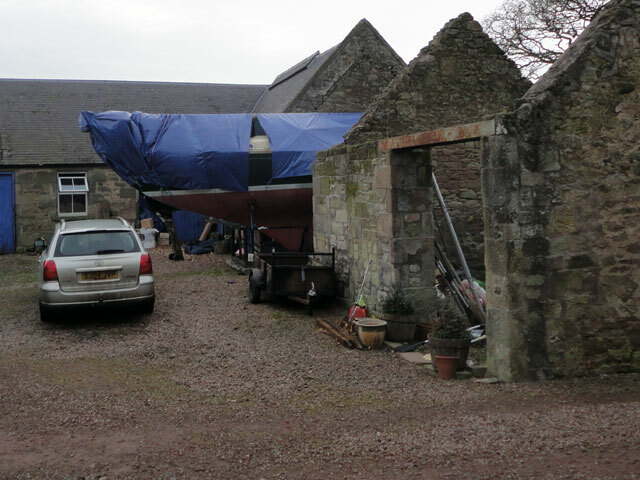 They graced the manse in Luss for many years until we got the huge table which had seen service in the Royal Navy. Then our table was transferred to Wemyss – it travelled in our Subaru and on the way there the rear axle broke and that was the end of the Subaru (and almost of the table as well). It travelled down to Mount Pleasant in the first removal and all that we knew was that it was somewhere in one of two barns. Tom and Dorothy arrived and all of us set out to find the missing table -- not only were there many boxes to circumnavigate but everything was covered with blue tarpaulins, and it was very dark. Dorothy and Rachel managed to uncover it and then Tom and I joined in and succeeded in lifting it over many other items of furniture – desks, a harmonium, bookcases – and out into the light of day. Tom and I went up to Pearsons to buy screws to reassemble the legs – the screws had been put carefully into another item of furniture with a drawer but we have no item which item of furniture or where that item of furniture might be. Finally the table is assembled and now sits looking really good in the front room of the farmhouse – reunited once again with its sideboard. 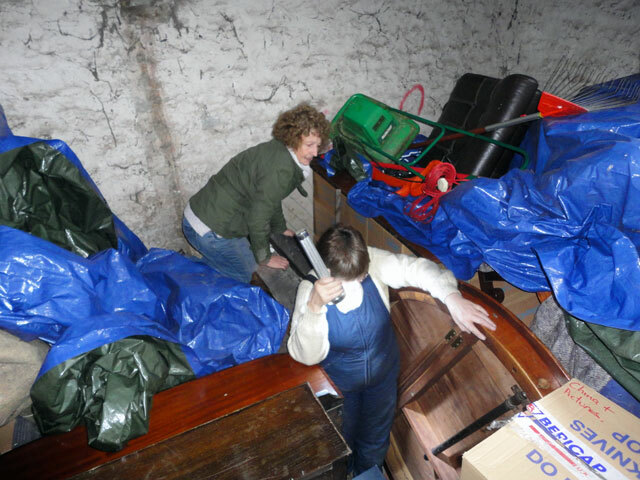 Tom and I spent much of the rest of the day ensuring that Ianthe is wrapped up against the winter storms. It was good to be back on board. She is looking good but with so much to do it will be next summer before we are able to start work on her again. By that time we will have built the summer house, completed the hen house and created a loom room in which Sandy and Rachel can ply their weaving craft skills. I got a telephone call from the BBC who wondered if I would agree to be interviewed about being retired. I think that their angle is speaking to folk for whom this Christmas will be different from last Christmas. I said I would be happy to take part and the presenter is coming to see me later in the week. I also got a call from the lady who plays the organ at the local church, wondering if the system we used in Luss and Arrochar might function here. She had spoken to us earlier and that was why we went to the church to experiment on Monday afternoon. 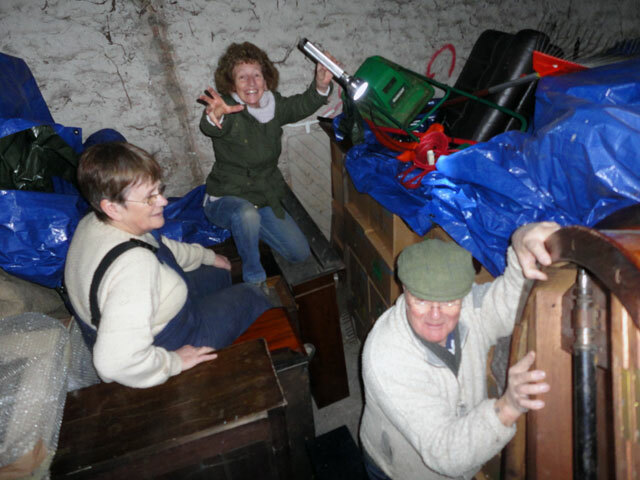 I was able to report that in an emergency we would certainly be able to ensure that they were not without music although there were still things which we needed to work out to get the best from the organ. Soon after this the Amazon delivery van brought me my purchase of a beard trimmer. It had only cost £7 .02p and I had ordered it yesterday because I still haven’t found my own one. It is somewhere in the barns but as it took a day to find a dining room table, you can imagine how long it would have taken to find a beard trimmer. Dined in the farmhouse with Mum and Digger and then returned to the Granary to tidy – while we had been releasing the table we found all kind of other things. These got brought into the house and now we had to find places to keep them. The walls are already beginning to bulge. I found a box which said ‘Dane’s clothes’ on it. Opening it excitedly I discovered that it contained my Princeton doctor’s hood, my sea boots and my dressing gown – I could have wished for items which were a little more useful. With enough done for this evening we stopped and watched ‘Lewis’ in front of the stove. It has got much colder today and it is lovely to relax in this way. How fortunate we are.